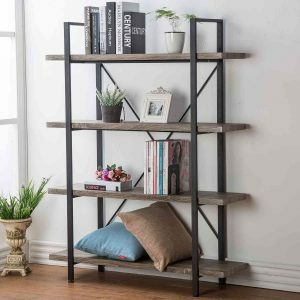 Dark Oak HSH Furniture 4-Shelf Bookcase (BC02-03) is the vintage industrial type, practical and versatile open wide office etagere unit that is made of rustic wood grain and metal. It was first available on Amazon.con at the beginning of 2018 but was reviewed by 36 customers and scores 4.9 out of 5 stars indicating great customer satisfaction. You have the option to get it as 2-shelf, 3-shelf, 4-shelf or 5-shelf with different prices on Amazon. HSH Bookshelf looks very modern and elegant, will be a nice addition to your home office and will fit in nicely with any decor, like a living room, study, dorm, family room or bedroom. It is suitable for use for your different storage needs and will let you organize your stuff better. So it is certainly not just a display shelf to show off some items. Whatever you put on it will be visible from different directions with its open shelf design that also offers lots of space. It has a rather solid and durable construction with high-level MDF material covered with wood grain PVC as well as the square steel tube frame. 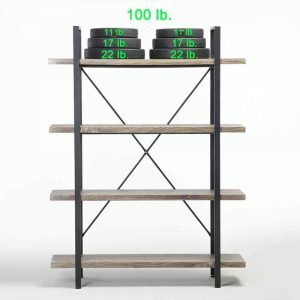 You can put around items that weigh a total of 100 pounds on each shelf as this is a very sturdy product with also metal cross bars under each shelf. You can have quite a few books on it without any problems. It comes in a very large box, requires minor assembly which is easy to do in about half an hour with its smarter design and the tools and spare parts you may need, provided in the box. It has the black poster-coated paint and dark oak with a brownish grayish color and has a simplistic modern design. The whole thing weighs 44.2 pounds (lightweight yet very robust) and measures 55H x 41.3W x 12.7D inches as assembled. The 2” (25 x 35.4 x 12.7 inches) and 3” (40 x 35.4 x 12.7 inches) models are 35.4 inches wide, while the 5-shelf is 47.2 inches (70 x 47.2 x 12.7 inches). Each shelf is 1.2 inches thick and the first shelf is about 3.2 inches off the ground. HSH Bookshelf is more stable than normal thanks to the strengthened crossbars, which also makes it more durable. So you can expect many long years of use out of it. It has a stand-alone design, stands firmly on the floor and does not need to be attached to the wall but you may want to set up the anti-tip kit that you’ll find in the box or brace it to the wall with the harnesses. You can adjust the four feet by about 1.5 inches if your floor is not flat and there will be no shaking or wiggling. It is not made of solid wood but feels even more solid. As a great quality and robust product, the company offers 12 months of solid warranty along with 30-day returns free of charge.